The taxi driver has nowhere to return to when he finishes his shift and tonight as he drives his passengers from A to B his mind drifts back to his old bedroom, where he would pull the blinds and fall asleep with the telly on low, and wake late and bring his breakfast back to bed where the telly would still be on, so that when he sits at a set of traffic lights, not noticing that the lights have changed and the passengers or passenger in the backseat or next to him in the front says you’ve got a green light, he just takes off again, slowly, saying nothing, unhurried, the passengers, sometimes a couple going home after a meal or a show, look at each other and shrug their shoulders, or two friends coming from a party turn their heads from their gaze out the windows; the blue-black sky, the homeless in the doorways, the lorries collecting shipments from Europe, and like the couple, shrug their shoulders, some fall asleep or daydream themselves after a late shift or a first date with a pretty girl or a handsome guy, and look out across the Liffey or at another car sitting next to the taxi and they themselves don’t notice that the lights have changed, and the taxi remains sitting there, with no other car behind it, the passenger replaying the scene of their date, the jokes about first dates, the ones about the disasters of internet dating, their plans of travelling, of pursuing their dreams, of improving everything about their lives, and neither the driver nor the passenger notices the lights going from green to red to green again, or the drunk girl stumbling off the footpath in front of them, peering in the windscreen at the two absent-minded inhabitants of the immobile taxi with its light still on, imagining that maybe they’re stoned, that it must be a taxi offering extras; a place to get high, and laughing to herself as she reaches the footpath on the other side, squinting at the screen on her phone, made more incomprehensible by the drizzle collecting on the glass, and the driver all the while is seeing his bedroom so vividly, almost like he’s there, like the city landscape has assumed the features and the shape of it; the wallpaper plastered on the buildings, the carpet laid out on the road before him, the blinds pulled down on the sunlight and the drizzle on the windscreen that is in fact running down his bedroom window and perhaps that’s why he doesn’t use his wipers now, adding to the stillness of the car sitting at the changing lights in the drizzle, until the passenger remembers where he is, on the quays, in the back of a taxi, that isn’t moving, hasn’t been moving, as the sky is becoming less black and more of a dim blue, outside a newsagent where milk and newspapers have been left in front of the closed shutters, the driver must be asleep, but no, the passenger can see that his eyes are open in the rearview mirror, that he looks like a statue, like a Buddha with half shut eyes, looking down at the dash or the steering wheel, what is it, is this guy alright, these strange people who work nights, sorry, driver, the lights are green, I nearly dozed off there myself, he says, and upon snapping out of whatever it was, the passenger sees the driver’s eyes barely lift from the dash to the road, he can barely feel the car take off again from where it had been sitting, but it is moving, just about because they’re approaching Capel Street bridge now, the driver hasn’t said anything, and they’re beside where the passenger works, where he will be working in the evening when the building comes to life with cleaners and deliveries and kitchen staff and service staff and then customers, and he doesn’t know now if he will remember this taxi ride, he might be reminded as he arrives this way to work because he came by here in the slow moving taxi, it might be a blurry memory, that there was something about the taxi ride; that it was slow and almost dreamlike, because that’s what’s happened to him; he’s subject to the driver’s dreamlike state, and he wonders is it safe, this driver, what, if anything, will happen next, should he get out here and hail another taxi, but the streets are so empty apart from some street cleaners, a lorry or two and seagulls picking at rubbish strewn across the footpaths and wet tarmac that leap to the side of the road as the taxi advances in their direction, at least the streets are mostly empty and it is probably safe to remain in the taxi, for that reason, and at least they’re moving and almost at the Custom House now, maybe it’s not such a bad thing, the taxi driver being in no rush, maybe he can relax and let his mind wander again, at least there is peace to do so, he’s in no rush that’s for sure, how long has he been working, has he worked so long that he’s entered this trance, unaware of anything; barely just the steering wheel in his sleepy hands, the pedals at his feet, the windscreen where his eyes appear to have gotten lost upon looking through it, through the drizzle, and the occasional brake lights of other cars, the driver is resigned to sleeping in this same seat, perhaps that’s why his foot is so soft on the accelerator; he has already arrived at his destination, he’s just barely keeping the taxi headed in the direction of the passenger’s house, if it suits him he might sleep on the street where this passenger lives, if he can park there and recline his seat, or he might sit there not sleeping until someone knocks on the window and says city centre please, and with that he’ll be removed from his old bedroom, like he was a boy again and it was his mother knocking on his bedroom door calling him to dinner, or his ex-wife, but it’s his next fare, bent over, peering in, knocking on the glass with his knuckles, opening the door and sitting in next to the driver, giving him a lengthy look, city centre please, I take it you’re on, your light was on anyway, hope I’m not disturbing you, and the driver, just like before, sets the car in motion, slowly softly so the passenger never feels the car moving till he notices they’re at the end of his road, and the taxi driver’s eyes through the windscreen, the passenger settling then to partake in the driver’s silent vigil, but unable not to feel a little like an intruder in the hushed space he’s just found himself in, having broken some spell with his knocking on the window and his words, but he’s in now and they’re moving, and the driver takes this one back along the quays as far as the Custom House where he turns and crosses the bridge to Pearse Street, to College Green, and the whole time the passenger gets a sense of something from this peculiar drive, like the car is driving itself, like the wheel is turning and though the driver’s hands are on it, it’s as if his hands are catching up with each turn of the wheel, rather than the hands doing the steering, and upon arriving at his workplace, an office near Christchurch, he seems a little astounded, a little over grateful for what was just a taxi ride, though he can’t be sure, and after parting with a generous tip and getting out, he sees that the taxi doesn’t move away immediately, then at all, but just sits on the side of the road, blocking a cycle lane, as the drizzle subsides and the drying begins on the tarmac, till his next fare arrives, at which point the last passenger had already entered his workplace about ten minutes before but had come to a window on the second floor soon after to look again at the taxi still there, but now the next fare has arrived and the taxi is moving once more, and somehow he picks up regular fares, without ever looking for one, without even leaving the spot where the last passenger got out, because each time one does he allows his mind to really wander deep and settle in that old bedroom; the pillows, the soft lamp, the telly and the music of the night hours playing over in his head, so that he isn’t sure if his eyes are open or closed anymore, until the next knock on his window, and each time the passenger or passengers sense something, something unspoken, something about the motion of the car, something that tells them the driver is dreaming, or sleep driving, or that something about the situation triggers the backs of their brains to recall dreams that were just like this journey through town in such a slow moving taxi, or a blind taxi-driver, because that’s what occurs to some seeing his eyes in the rearview mirror, that his eyes almost reflect the road, that his eyes are too distant, that if they weren’t driving in the city centre and his eyes weren’t obstructed by traffic and buildings, the driver’s eyes might be fixed on a point out at sea, and then even when there is an almighty glare from the road, he just appears to look right through it, and then there is the lightness of his foot on the accelerator and something else about the motion of the entire car that makes some passengers feel as though there is a force that wants them to sleep, to forget about their business, their meetings, and sleep softly, there in the backseat, to surrender to this dream experience or fight it as some insist on doing, but silently, because after the first few words upon getting into the taxi, silence persists, that bit they can’t fight, because each one feels the same, that they’ve entered this driver’s space, and if he isn’t talking then neither will they, and some are more at ease than others, and while other drivers spend their days and nights sitting at ranks along Dame Street and O’Connell Street, waiting, wide awake, reading papers, talking on their phones, drinking flasks of coffee and cans of energy drinks, he just drifts by, always occupied, always with his light on, becoming more and more a passenger himself in one of those dreams, the ones in which you must perform some absolutely crucial task, a task requiring an act of strength, of muscle power, or to drive a car to safety, to keep it from veering off the road, but your muscles have abandoned you and the car feels like it’s driving itself and how can you trust it, and that’s what is happening and that’s what his passengers sense, and then he decides he better call it a night, once he’s dropped this last fare off, this young couple who are too busy kissing anyway to notice anything strange, in fact they seem much less inhibited than one would expect, maybe it’s the driver’s indifference and his eyes like the eyes of a blind man, because he’s in his bedroom now, and unbeknownst to this young couple, so are they, once he drops them off that is, in Chapelizod, he’s decided he’ll turn into the park and pull over beside the zoo, and recline his seat there, with his window open an inch, letting the cool air in from the trees and the grass where the tagged deer are sleeping, so that it will be on his head and on his brow and his neck, so that he’ll hear the sounds coming from the zoo; sounds of the jungle, of the African plains, of the rainforest, from the enclosure in the otherwise silent park, he’ll drift off there, he’ll finally let his mind rest, having got his duvet from the boot of the car, he’ll be in his bedroom then, and he’ll fall asleep with his hand on the handbrake, and it will remain there, if he makes it that far that is, to Chapelizod and then the park, he can almost hear the animals now, how long has it been, that he’s been driving, how long has it been since he slept in that old bedroom, since he shut his eyes, would they notice if he shut them now? 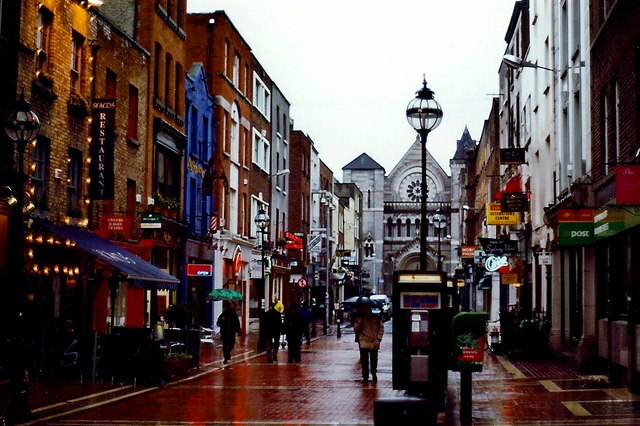 This entry was posted in Europe, Writing and tagged Dublin, homelessness, Ireland. Bookmark the permalink.